Arcimoto is a Eugene, Oregon-based 3-wheeler EV maker. They refer to their vehicle as an FUV “Fun Utility Vehicle.” They have filed an SEC Form 1-A to start selling common stock shares under Regulation A. This rule allows the startup to raise capital and sets the stage for a future listing on the NASDAQ. Regulation A is a relatively new way for startup companies, like Arcimoto, to offer equity to the general public. If you are interested in funding a startup, this is a much better option than something like Kickstarter. With Kickstarter you don't have any equity in the company. For example, Oculus had a very successful round on Kickstarter and was subsequently bought out by Facebook for $2B, but backers didn't receive any share of the windfall. They just received the rewards for their backing level. Many Oculus backers were bitter about being left out. 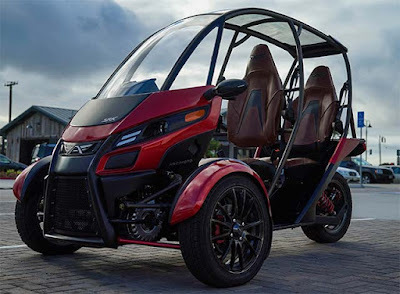 IPO shares, like Arcimoto is offering, on the other hand, make you a partial owner of the company and are a better way for crowdfunding backers to join in the companies success. Arcimoto was founded in 2007 to "catalyze the shift to a sustainable transportation system." The company's name means “Future I Drive.” They aspire to invent new patterns of mobility that are more efficient, environmentally-friendly, and affordable. Arcimoto plans to replace the 4,000+ pound internal combustion engine vehicles that clog our urban and suburban roads with their FUV, the Arcimoto SRK. The SRK is a pure electric ride that's one-quarter of the weight, one-third the cost, and ten times as efficient as the average US passenger vehicle. The Arcimoto SRK delivers an estimated 230 MPGe and has a target base model price of $11,900. Arcimoto has taken the SRK from a napkin sketch, through eight generations of product development, to a refined design that is nearly ready for production and product launch. The Arcimoto investment web page and introduction video are here. Much of the above was sourced from Arcimoto. Who Killed the Fuel Cell Vehicle?